Tips om beter downwind deiningsgolven te nemen en meer rendement uit uw paddle slag te halen. Hoe verlaat je de golf? Uitdraaien... bekijk onderstaande instructie video. Make sure you try stand up paddle for the first time on flat water. To many people head to the surf to soon. They really get thrown around and end up having a bad experience. Flat water means you have less water movement to deal with and can therefore really get an idea of how the board feels under your feet. 2. Stand Over the Center Handle of the Board. Typically the most stable area of the board is where the center handle is located. You will want to straddle your feet over the handle. By straddling the center handle with wide stance you will create more stability. The closer your feet are together, the less stable you will be. Once you get the hang of paddling try testing different widths with your feet to see how you prefer to stand. It is extremely common to see first time stand up paddlers (and some who have been out several times) holding their paddle backward. You should hold the paddle so that when it is held out in front of you, the blade (rounded area that goes into the water) it is bent slightly up toward the sky. If the blade is tilted down toward the ground or water, it is backward. It may not look correct in the beginning to have the blade tilted up, but that is definitely the correct way to use the paddle. Many people look straight down at the board which actually makes it harder to balance. Keep your eyes focused out on the water in front of you. Begin by taking a few small, easy strokes. Once you feel comfortable then begin to slowly increase the power and speed of your strokes. Using a leash is not only more safe, but it also helps make sure that your board doesn't float away from you if you fall off. Also, a life jacket helps just in case something goes a little wrong. It is always nice to have a some extra help staying above the water. Whenever possible go with someone who has more experience and who can help you make adjustments to your paddling. Besides it is always much more safe to paddle with a buddy. There is no shame in falling, in fact, it's fun to fall and take risks as you test out the SUP board and get used to the way it feels and moves. Just do your best to fall into water that is not to cold! Finally, bring a camera to prove that you now know how to walk on water, and please send Supconnect your photos so we can share them with others online. When will be your first stand up paddle time, or when did you try SUP for the first time? Here's the first of a series of technique and gear video I'm working on. - The parts of the paddle. You'll be surprised how many people I come across who don't know which way the paddle faces in the water. Hopefully this helps make sense of things..
- How to use a Type 5 Inflatable PFD. - Sizing a paddle - issues of a paddle to short or too long. - Paddling out in surf. 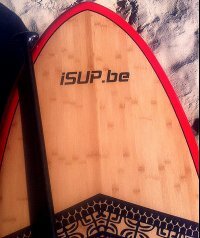 Enkele tips voor de beginnende SUPer: hoe op het board staan, hoe paddle vast houden en paddelen..